The DRPA Board has approved a recommended list of candidates for its first DRPA/PATCO Citizen Advisory Committee. Pennsylvania Auditor General, Jack Wagner, who serves as an Ex-Officio Commissioner on the Board, first introduced the Resolution that created the Committee on September 15, 2010. In the Resolution, Auditor General Wagner urged the Board to create the Committee to provide the Board with direct input from citizens who live within the DRPA Port District and who use DRPA and PATCO facilities. The Committee was created as a result of DRPA’s increasing efforts for transparency and community participation. The Bicycle Coalition's Research Director John Boyle was named as one of the 12 New Jersey Representatives. 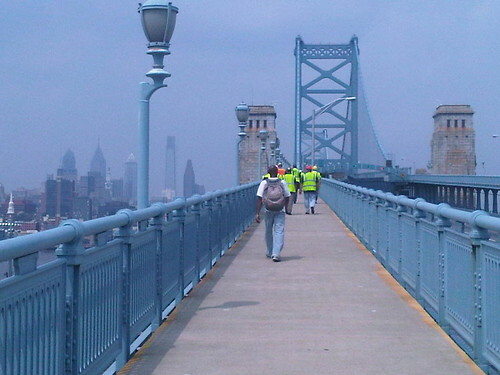 We suspect that John may be the only representative on the board who uses the full spectrum of DRPA services including Ben Franklin Bridge Walkway, PATCO, the Betsy Ross Bridge and the RiverLink ferry. Full press release from the Delaware River Port Authority. I hope good things come out of this advisory committee - maybe they can bring some attention to clearing the walkway of snow. I just received an email notice that the walkway is open again... I am so excited the end of winter is near.